Our clients were recommended to Build Professional as they were looking for a professional company to internally renovate their current home. Our client’s home was a quaint separate town house that required renovating to be brought up to date. The current home felt quite dark, dated and was not functioning to its full potential. Our client’s wanted to update the kitchen, bathroom, ensuite, living and dining, alfresco area and exterior of the home. Originally our clients also discussed wanting to extend their living space however we were conscious of their budget. The discussions led to the possibility of living through the work and a clever schedule was administered for a two stage production program to provide their privacy with the works happening around them. The Build Professional team listened to our client’s brief and came up with a design that would modernise their home, improving the flow and function and the connection between the indoor and the outdoor areas. The feeling of light and space in the living areas was resolved without extending their home. 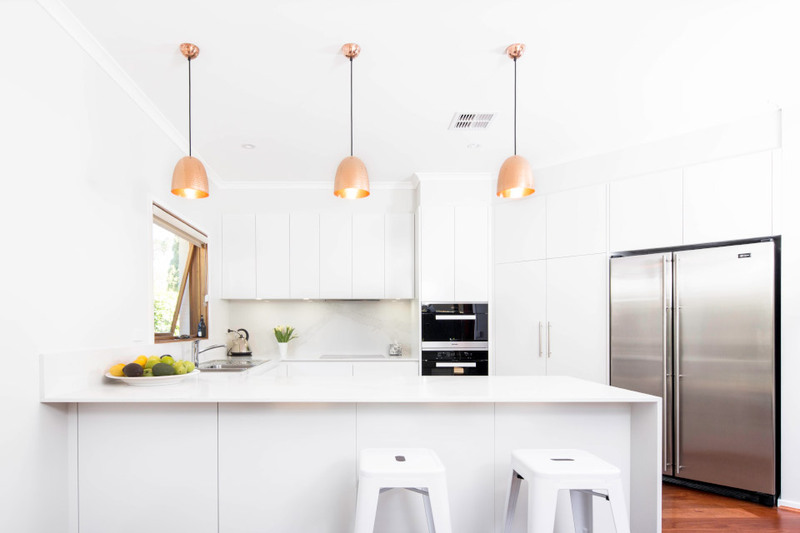 The existing home had in-slab heating and all remodelling work, especially the Sydney Blue Gum floor coverings had to be specifically considered in this design and build. The new timber flooring was laid throughout the entrance, living, dining and kitchen areas. New floor to ceiling timber windows and timber stacked sliding door were added along the northern side of the living and dining room transforming the space from dark and dingy to light and bright. The original kitchen was enclosed, lacked storage and like the rest of the house felt small and dark, a new open plan kitchen was installed into the same position but now had connection to the dining, living and flowing outside to the alfresco area. New lighting and painting added to the new ambience of the entire home’s interior. The main bathroom and ensuite were remodelled, it was requested that the new shower in the main bathroom was enlarged; the original hob in the shower was also removed to give the shower a seamless and updated look. We removed and demolished the rear garden, deck, pergola, trees and grinded the stumps as well as removing the front garden to gain access down the side of the house to the rear of the yard. The new deck provides a balanced component to the beautiful gardens with pavers set apart with a creeping thyme throughout and now providing a functional outdoor entertaining area suffice for their needs with recycled Turpentine wharf piers as the pergola posts and Ironbark rafters to support a creeping ornamental grape that will cover and shade the deck and home in the summer months. A new deck also replaced a tired old deck off the master bedroom. A fresh coat of paint to the exterior completed this renovation project, injecting life back into our client’s lovely home. The newly painted exterior added a fresh backdrop to the beautiful landscaped gardens. the 27th October 2015 and this was a result of a well organised and careful planning approach that helped the construction team to execute on time and on budget as expected. Our clients are extremely busy professionals who throughout the design and construction process could mostly meet outside of working hours or weekends, the Build Professional team worked hard to accommodate their needs and schedules as we pride ourselves on offering our client’s the best possible service. During these times we developed a great relationship and take great pleasure in their happiness with their completely renovated home. Our clients are thrilled with their new home; together we have achieved a tasteful and refreshed home that will stand the test of time. A home that feels spacious; filled with natural light and warmth offering a beautiful connection with the outdoor areas and landscaped gardens.